Below is a list of the featured miscellaneous products from BNZ. Refractory Bonding Mortars are finely ground refractory materials which are plastic, or become plastic and trowelable when mixed with water. Our mortars are suitable for laying and bonding insulating fire brick and most clay-based dense fire brick. 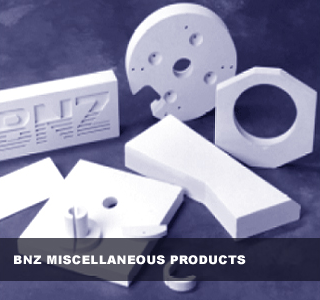 BNZ manufactures a variety of insulating and dense castable refractories to meet the exacting needs of the high temperature processing industries. These hydraulic setting products are suitable for installation by various methods including gunning, casting or slap-troweling. Each product is specifically formulated to economically obtain the desired properties for the application and service temperature for which it is intended. ZelieBlok is a calcium silicate board manufactured by a unique patented process together with a patent protected formulation utilizing the highest quality raw materials. ZelieBlok designed to serve as a backup insulation for any refractory construction, such as insulating fire brick, dense refractory brick, castable, gunning mix, plastic refractory or ceramic fiber. BNZ Materials’ Blazelite insulating aggregates are formed by crushing large slabs of specialty formulated low-density insulating material. The pulverization process is done with special equipment designed especially for this type of material. If your oxygen fuel cylinder is not separated from the fuel gas cylinder with an approved barrier, you do not meet regulations and you are in violation – subject to an OSHA citation.